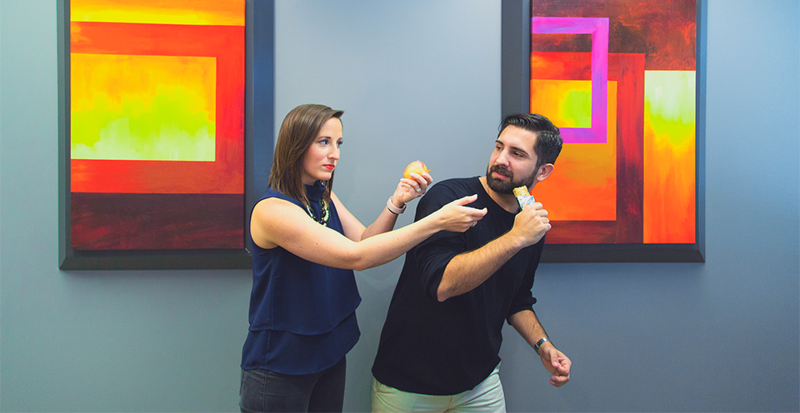 We’re super excited to welcome Katelyn McCracken and Josh Hesami to the 1820 Productions team! After interviewing hundreds of qualified individuals the 1820 family unanimously agreed that Josh and Katelyn were the ones we just couldn’t let get away! Here at 1820 Productions, our culture is just as important as skill and fortunately, these two have the right mix of both! Katelyn joins us from the journalism world where she used her type “A” personality to keep video productions rolling smoothly. She is now bringing her lightning fast wit, competitive spirit and outgoing personality to support 1820 Productions in becoming even more efficient when delivering amazing videos to our clients. A few things you should know about Katelyn: She’s a wealth of information when it comes to healthy eating, she secretly wants to be a sommelier and she “claims” to have dance skills that rival J-LO’s. Josh grew up in Pittsburgh Pennsylvania and has alway been passionate about story telling. Before joining 1820 Productions, Josh traveled the world creating award-winning documentaries. Josh will be using his boundless enthusiasm to write, edit and develop video projects with the 1820 team. In the short time he’s been with us we’ve learned that his last name is Persian and pronounced HUH-SAW-ME, most days he eats protein bars for lunch and he likes to bake chocolate chip cookies with his industrial heat gun! Joining a new team can be scary, but we have a feeling these two are going to fit in just fine! Please drop them a line on our Facebook page to help us welcome them to the family. If you’re interested in learning more about our team or want to know how we can help you, check out our website or give us a shout through our contact page.